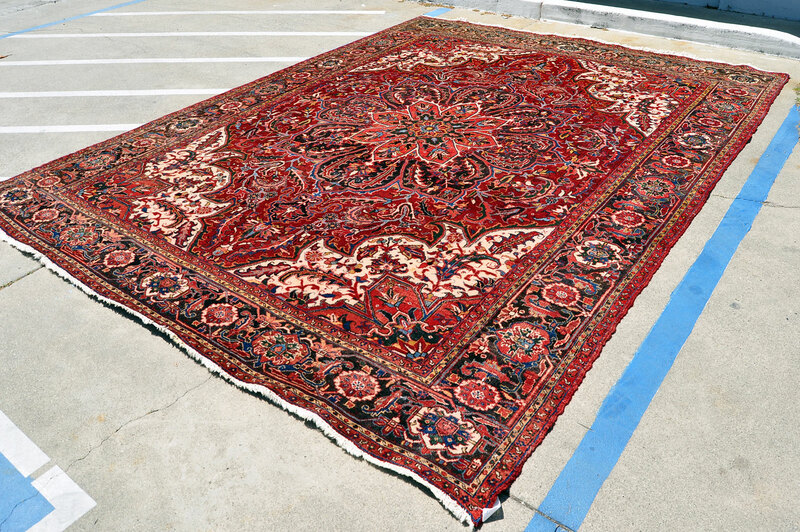 Traditional Persian Serapi Heriz rug with a large central medallion. 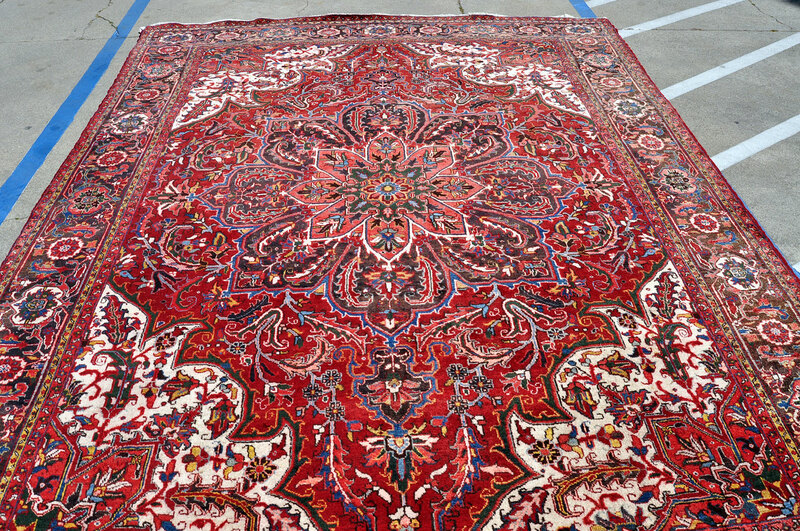 Fantastic vintage rug, extremely solid and heavy, with thick pile & a dazzling motif. Some pile wear from normal use. No holes or weak areas, etc. Some abrash (natural color variegation) in the reds and greens; also, moderate fading in the blacks along the border. Natural wool woven onto natural cotton. 1940s – 1950s. 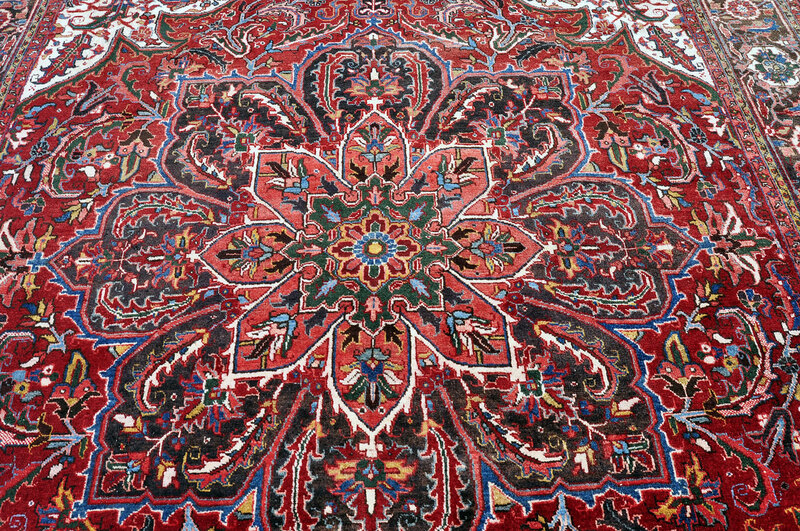 Estate rug from Europe. Professionally WASHED! Clean and free of all odors. Very HEAVY! This rug can be placed in a high foot traffic area without worry. Extra PHOTOS available upon request! This is an authentic Heriz rug from northwest Iran and was woven near Ahar. 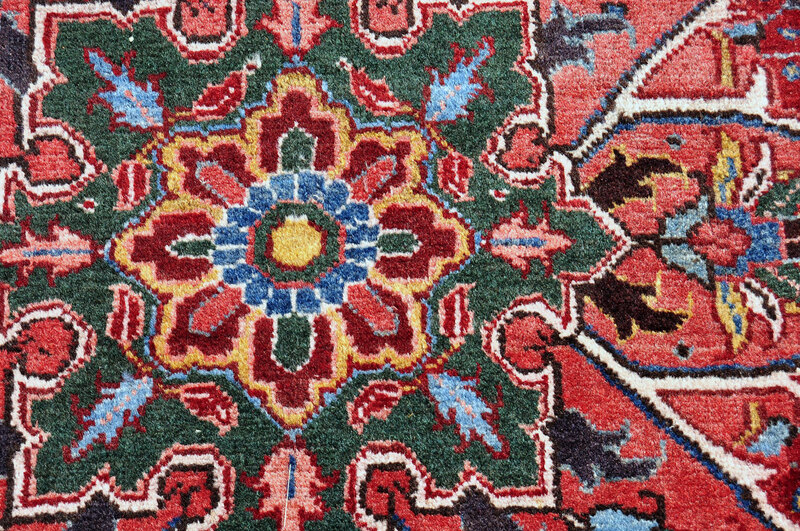 These rugs are produced in the villages scattered across the slopes of Mount Sabalan, northeast of Tabriz. 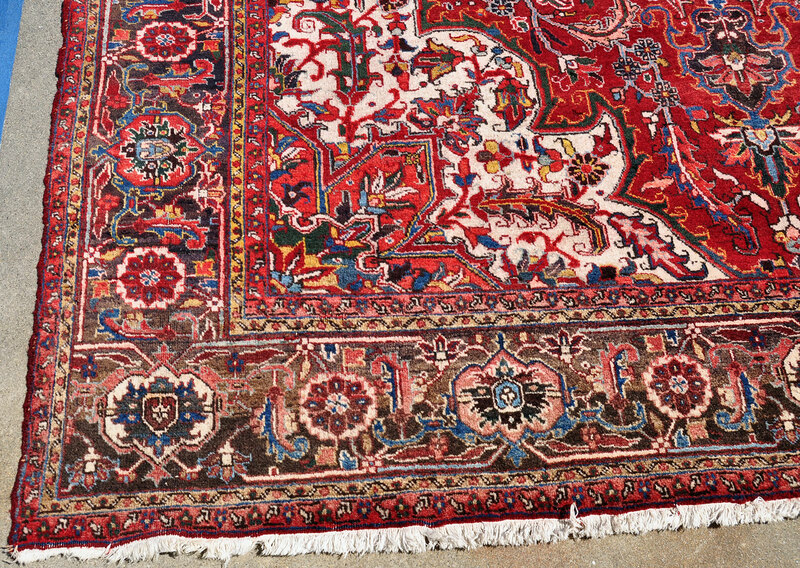 The Heriz rug has became one of the best known styles of Persian rugs in the world & is often copied. It is an extremely durable & hard-wearing rug. 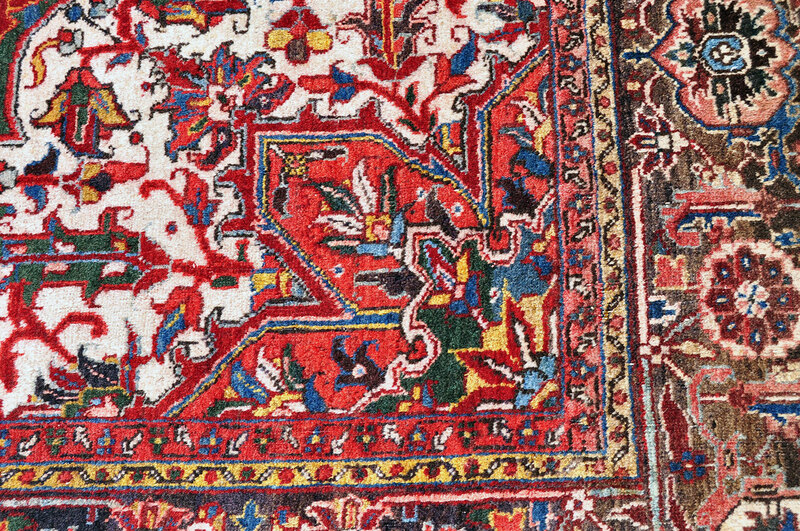 One of the alleged reasons for the toughness of Heriz carpets is that Mount Sabalan sits on a major deposit of copper. Trace copper in the drinking water of the sheep supposedly produces high quality wool. The copper makes the wool stronger and far more resilient than wool from other areas. 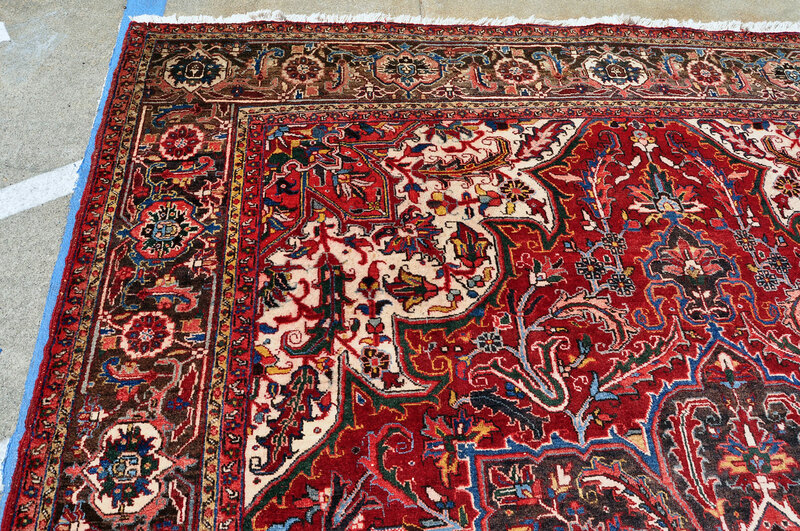 Heriz rugs originate in towns such as Ahar, Heris, Mehraban, Sarab (Serapi), Bakhshaish, and Gorevan. Many of the weavers in this region, which borders the old Soviet Republic of Azerbaijan, are native Turkish speakers. The rug is $1,350.00. It can be picked up in person in the East Bay, Santa Cruz, or Montery. Shipping is an option but it will be around $125 or so with FedEx as the rug weighs over a hundred pounds. You can pay with a check, money order, or Paypal. Please email me with questions or to request more photos. Thank you.